This is a WIP (Work in Progress). The necklace is done, but I still have to do the bracelet and earrings. 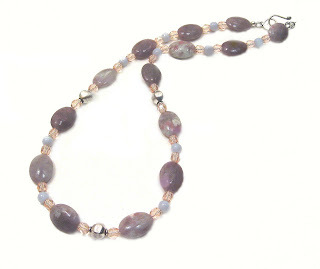 The stone is Lepidolite, and there is also Blue Lace Agate, Czech Glass and Sterling Silver accent beads. I'm thinking spring since tomorrow we are in store for another big snow. A lot has happened since I visited my daughter at Christmas. First, we had a wonderful visit, me, her, my hubby, her hubby. Amy is so creative; she is a jewelry maker with an emphasis on Precious Metal Clay, so we had lots of catching up to do, both personal and artistic. Now, since she is in Maryland, she is literally up to her ears in snow. We didn't get any here in Lowell, MA. I always love to see the big fluffy flakes coming down. These are wonderful venues, as is Etsy (my Etsy url is on the lower left of the page), and as I continue to create new works of jewelry art, I continue to build my shops inventories. Right now I'm working on a necklace set using Lepidolite, which is a lovely stone that has different colors of purple and lavendar. To the left is a WIP (Work in Progress) picture. Coming Next: what's new with my visual art.